When Gov. 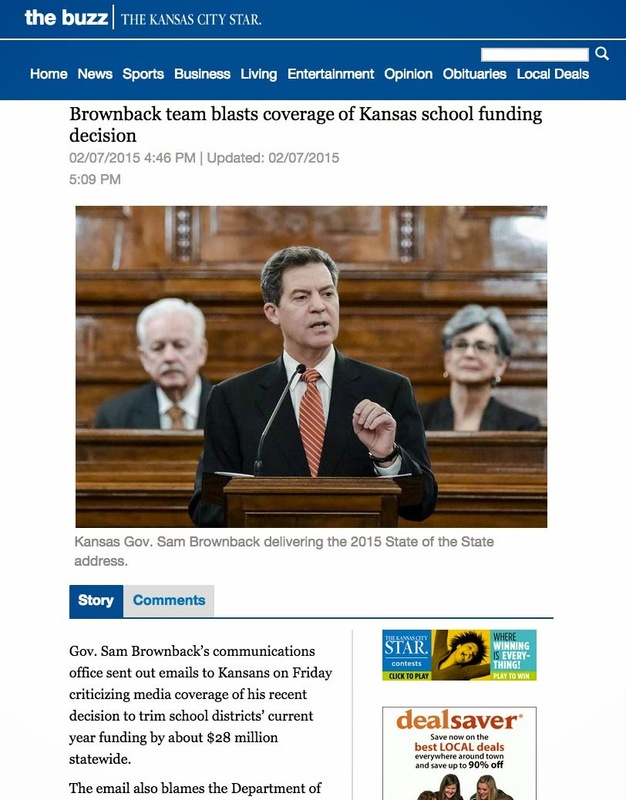 Brownback spoke to Kansans in his state-of-the-state address last month, he called for a school finance formula that “should reflect real-world costs and put dollars in classrooms with real students, not in bureaucracy and buildings and artificial gimmicks.” Then the next morning he did the exact opposite. He released his budget, proposing a $127 million cut right at the heart of public education—from classrooms. Not only that. The governor wants to sack the state’s school finance formula in favor of a “block grant” to schools, which would make that $127 million cut permanent and shut off any future funding increases for schools from the state. Why would he propose this? How does this help Kansas? Well, it doesn’t help Kansas schools or Kansas students, but it does help staunch a budget crisis created by a dramatic loss of income tax revenue. School finance is the largest item in the state budget, putting school funds directly in the firing line when state finances deteriorate. The governor says the school finance formula is too complicated, even suggesting that it was deliberately designed that way in order to confuse Kansans. It’s not. Rather the formula helps make sense of a complex situation, and provides funding in a fair and consistent way. Kansas has 460,000 students with a wide range of abilities and varying needs. Those students receive education in 286 school districts that range from tiny, to quite large, from rich in property resources, to poor. Such a situation requires a reasoned, rational method for distributing funds which recognizes that one size does not fit all. At root, the current formula provides a set amount per student. That’s a fair foundation. Growth in student numbers brings more funding, a decline, less. But not all students are the same, so the formula adjusts funding upward for students who are “at risk” and need extra attention, for students who need bilingual education, and for students who are in vocational programs. Large geographic districts logically receive more money per student for transportation. The formula also helps equalize how much each Kansas citizen pays for education through property taxes. Any formula may need to be adjusted from time to time to make it better, but dumping the entire Kansas school finance formula, as the governor proposes, will immediately lead to funding inequality, unfairness, and less money from the state. Aside from state funding, school districts only have one other significant source of revenue — property tax receipts. A cut in state funds that will be frozen in place by a block grant forces districts into impossibly difficult choices. To make up for disappearing state funding, school districts will have to reduce classroom spending or raise property taxes. School districts get this choice because the governor’s fiscal experiment is failing. State tax revenue has fallen far below normal, reasonable expenses. Instead of fixing the real problem, school kids and property taxes are asked to pay the price. — This piece was first published in multiple Kansas newspapers last weekend.